Nathalie was a kindergarten student in Kristi’s class at Vida Abudante School when we first met her. When she was young she was vaccinated with a dirty needle. As a result her right leg began to develop much slower than her left leg. By age 6 Nathalie’s right leg was six inches shorter then her left leg. Throughout that year, God continued to put Nathalie and her family on our heart. Kristi began looking for a specialist who would see Nathalie. Scottish Rite hospital in Texas agreed to see Nathalie the summer after her kindergarten year. At that time it was suggested that Nathalie wait until she was 9 before undergoing any treatment. 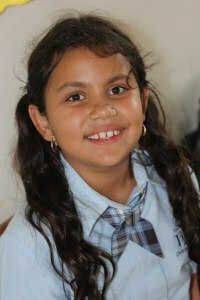 Nathalie returned at the age of 9 years old to the States for her second appointment. The doctors suggested that she undergo a procedure to remove the growth plates in her “good” leg allowing the shorter leg a chance to catch up. Bravely, Nathalie underwent this procedure and has recovered remarkably well. Nathalie now will wait until she is 14 years old to determine if she will undergo a leg lengthening procedure in the shorter leg. To make things harder, in the fall of her first grade year, Nathalie lost her father. Through this tragedy Nathalie’s family continued to reach out to us and a very close friendship grew even deeper. Through this tragedy, medical needs and daily life, God has grown our friendship and our families to be some of our closest friends here.